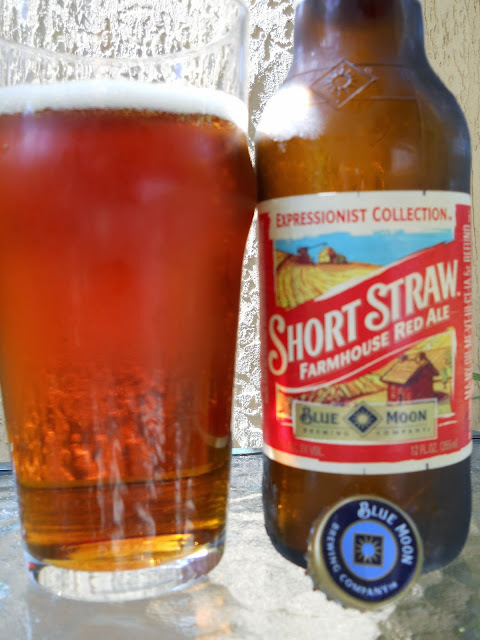 Today I'm checking out Short Straw Farmhouse Red Ale, "an intriguing interpretation of a Farmhouse Ale blended with a Flanders Red, with hints of white pepper and a tart finish." Pretty ballsy description from Blue Moon Brewing! This beer is a member of their Expressionist Collection--not sure I've seen others but I'm sure it's for a lack of looking. I hope the beer is more intriguing than the effort they put into the label. Giant name of the beer over an extremely trite thumbnail illustration of a red farmhouse next to some fields of grain. 5.8% alcohol. Orange, light hay and grain on the nose, though I really had to work for it. Sweet, fruity apple and orange flavors come first. Some grain and a little funky hay work their way into the mix after a few sips. But that's it. Pretty thin and bland overall. The finish has a metallic twinge to it as well. I think it's a stretch to call this a farmhouse ale and there is zero Flanders Red tartness promised, so the marketing team obviously never drank one sip. Either that or the brewers didn't bother to read the marketing description before crafting it. Anyway, this beer is probably exactly what BM was going for, something different for their BM drinking base. But if they think this beer will win over anyone that has tried a real craft beer or two, they are seriously mistaken. This is an awesome beer. If you like bloody Mary's also..this is a good companion. I like to put a little beer in mine.